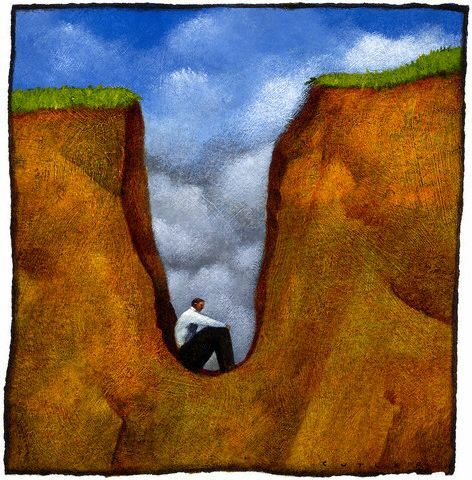 A recent blog post by Wray Herbert describes sunk-cost bias as “the tendency to persist with an endeavor once we’ve made an investment of money or time or effort.” He paints it in a negative light, calling it an “irrational” behavior. I get what he’s talking about. I can’t count the number of times I’ve put up with an unhappy situation as if there were no alternative. Part hopelessness, part fear of change (even if just about any change would be an improvement), part stubbornness (“No one’s going to make me do something against my will…”). This may be an instance of painting with too broad a brush, though. Sometimes, even when we are suffering and a situation is far less than ideal, there are good reasons for remaining right where we are, continuing to do the exact same thing. We may know that things will get better soon. We may believe that the intolerable situation we’re experiencing is worth it to achieve a goal we consider important. I’ll give you an example. My first marriage, for all practical purposes, was over after about a dozen years. It would be 18 years, though, before we divorced. Some of those intervening years were among the most painful of my life. If I had physically left the marriage after 12 years, though, I never would have experienced the final three years. During that time, we attended marriage counseling, where we discovered that, ultimately, we did not wish to save the marriage. In the process, though, we worked out most of the issues that had undermined our marriage. Consequently, as we worked through the particulars of the divorce and chafed at the shackles of trying to sell our home in the wake of the 2008 housing market collapse, we rediscovered the friendship that had brought us together in the first place. We also gave our daughter a lasting image of her parents as friends, rather than as mortal enemies and screaming lunatics. Tough as those years were, I wouldn’t go back and redo any of them. Mr. Herbert points to mindfulness as the solution to the inertia of sunk-cost bias. I’d amplify that notion, though, to say that mindfulness allows us to discriminate between the moments when we are being irrationally anchored to a painful experience and the times when the best course is to stay put. Sticking out an unpleasant situation is not always inexplicable; it is sometimes the right thing for us and those around us. The teachings I have received as a Buddhist also remind me that change is always occurring – in fact, change is an immutable part of existence. Which means that no situation is permanent, no specific form of suffering unending. In dire times I remember the words of a Sufi poet, “This too shall pass,” as well as those of Julian of Norwich, “All shall be well, and all shall be well, and all manner of thing shall be well.” And then a song by U2, “Stuck in a Moment,” starts playing in my head. I sing along and the present situation seems less dark, less inevitable.